This little room is hard to photograph because if you back up far enough, you're out in the hall. Bella's room is tucked up under the eaves of the roof, and doesn't even have the floor space for a bed. See the ladder in the picture above? She climbs that to hop in for the night, in a double-bed sized cubby hole. She spent June and July removing the ten-year old blue wallpaper from her walls and ceiling, and then the Composer and I painted everything Provence Creme, at her request. Well, the ceiling is Atrium White, and so is the bed nook. The floor is a white I can't remember the name of--it's off-white. And all her furniture is white. Mother just finished hand-quilting Bella's new quilt, "Freshwater Pearl," which I pieced before the whole room redo. It certainly looks at home in this sunny space. Lucky Bella, what a pretty room. Small rooms are hard to photograph aren't they. Sweet dreams for Bella in such a lovely boudoir. I'm guessing it's a little tricky to make the bed. Very pretty. Ohh my how I love it!! So very pretty!! It's the perfect getaway to read, journal, or just to ponder. Love the shiny floor paint, and beautiful quilt. cozy and bright. Love it! I long to see more photos of the layout of your schoolhouse-turned-home. Such sumptuous spaces! oh, so dreamy! I adore nooks. I dream of having a cupboard bed or some such. And we don't even have an attic to have the sloped ceilings! So I do really admire Bella's bedroom. Such an adorable room! 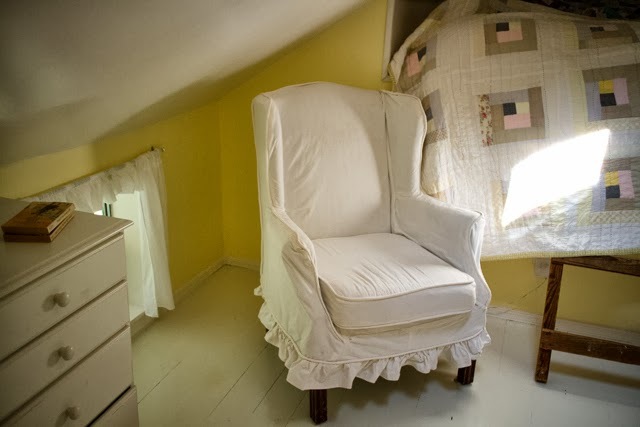 I used to dream about sleeping in a room like this when I was young - right out of the pages of the English storybooks I used to read. That is so pretty and sweet. I love nooks and crannies. It sounds like a wonderful 'nest'! Does Bella hit her head? The quilt and paint are just lovely! I've been thinking about this and trying to think what novel passage the photo reminded me of. Got it! My favourite "Anne of Green Gables" Chapter 23. The east gable was a very different place from what it had been on that night four years before, when Anne had felt its bareness penetrate to the marrow of her spirit with its inhospitable chill. Changes had crept in, Marilla conniving at them resignedly, until it was as sweet and dainty a nest as a young girl could desire. The velvet carpet with the pink roses and the pink silk curtains of Anne's early visions had certainly never materialized; but her dreams had kept pace with her growth, and it is not probable she lamented them. The floor was covered with a pretty matting, and the curtains that softened the high window and fluttered in the vagrant breezes were of pale-green art muslin. The walls, hung not with gold and silver brocade tapestry, but with a dainty apple-blossom paper, were adorned with a few good pictures given Anne by Mrs. Allan. Miss Stacy's photograph occupied the place of honor, and Anne made a sentimental point of keeping fresh flowers on the bracket under it. Tonight a spike of white lilies faintly perfumed the room like the dream of a fragrance. There was no "mahogany furniture," but there was a white-painted bookcase filled with books, a cushioned wicker rocker, a toilet table befrilled with white muslin, a quaint, gilt-framed mirror with chubby pink Cupids and purple grapes painted over its arched top, that used to hang in the spare room, and a low white bed. Her room is certainly beautiful,all family members have done a wonderful job, including Grandma: what special memories. What a charming little room! I love the bed cubby :) And the new quilt is beautiful, too. Just like Margo, I've always wanted a bed in a cupboard or nook! So far haven't had the chance to make that materialize :( Lucky Bella! My little girl would love a nook like that. Right now, she inhabits the enclosed porch. We can throw back the heavy drapes on the 3 large windows and let the natural sunlight just flood in. It is small, but suitable for her and she loves it. If she'd keep it clean and tidy, I'd love it, too. It is fun to make living spaces out of unconventional corners. That room is so totally romantic. Lucky Bella! I keep coming back to these pictures! My daughter Amelia (6) and I like to look at these pictures or think about it right at bedtime -- such a sweet start to sleep! We have had lots of fun dreaming about having a bed like that! 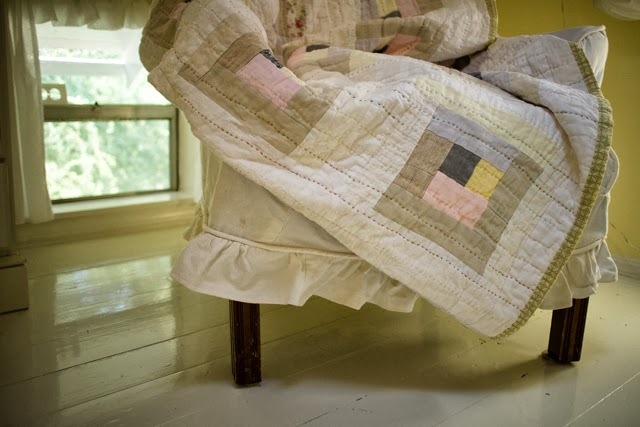 Tucked in under about four weighty quilts with that stunner quilt on top. I just wanted to tell y'all how much we adore this little glimpse!